Experience an abundance of priceless luxury. Four Season Residences Austin Tx towers 32 well-defined stories atop its forefather, the world famous hotel chain, Four Seasons Hotel. This downtown empress boasts of high end on-site and in-room amenities assuring each resident a delightful stay. Four Season Residences for sale in Austin advocates a mission to deliver comfort and exceed client expectation. Unit owners may avail of world-class amenities, among them are 24/7 concierge services, room dining service, housekeeping service, guest valet parking, access to Four Seasons Hotel’s 5500 sq. ft. Spa with lounge, eight treatment rooms and eucalyptus-infused steam room, a state-of-the-art fitness center with a lovely view of the Lady Bird Lake, elegant star-light entertainment room with catering kitchen and staff for your private parties, a residents’ library on the 32nd floor, outdoor dining, entertainment areas, a pool with panoramic views of the City Skyline, Lady Bird Lake, and Texas Hill Country. Ensuring homeowners of optimum security, Four Season Residences Austin Tx features controlled access to residential floors and parking garage. Meanwhile, all 148 units offer room amenities including 10 to 11–foot-high ceilings, over-sized windows, hardwood floors, in-wall stainless kitchen appliances and over-sized private terraces with marvelous views. Choose from a variety of floor plans measuring 800 to 5500 square feet. Four Season condo prices range from $400,000 to $4M. 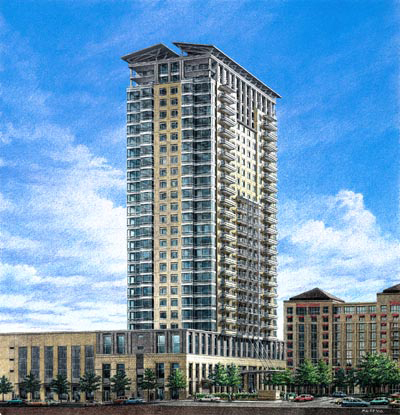 Since its completion in 2010, Four Season Residences Austin Tx has become of the most popular among Downtown Austin Condos. The building is managed by Four Seasons Hotel so unit owners are granted the privilege of accessing TRIO, Four Seasons Hotel restaurant, and the hotels lobby which features specialty drinks, Hors d‘œuvre, and an Afternoon Tea service, to complete that luxurious experience. A truly magnificent experience awaits you at 98 San Jacinto St., the address to have in downtown Austin.